It was a Thursday, like any other Thursday, really. It started off with all the normal routines, but then clear out of right field, we texted each other and set up a cooking date. With one Scrumptious Little in tow and the other sent off to the sitter, we attempted our first ever afternoon of cooking — together — in one tiny, very dysfunctional kitchen — for this blog. The end result speaks for itself proving that no matter the shape, size, or functionality of your kitchen, you can do great things! We believe in you. Now go get cooking! Well, first peruse this for the recipes and then get cooking! 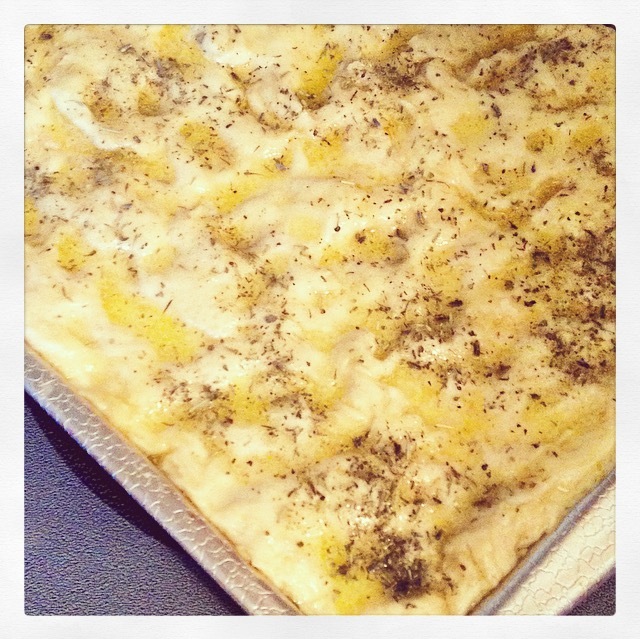 We started the day with Focaccia Bread. We found the recipe on Food Network. But here’s a sneak peek to wet your palette! DISCLAIMORS: 1)We added coarse sea salt, melted butter, fresh minced garlic, herbs de provence, 4 cheese Italian blend for the top before baking, to your liking, and then we added more cheese a few minutes before we pulled it out of the oven. Furreals, this bread is out of this world and will blow the socks off of anyone who eats it — if they’re wearing socks. And now for the main course! The whole day, we pronounced this “ga-nosh.” We know better, but did it anyway. You gots to live a little. However, if you’re talking to a professional, please do not do as we do. You’ll want to say “no-key.” Using the correct pronunciation will prevent any weird stares and awkward moments. You’re welcome. 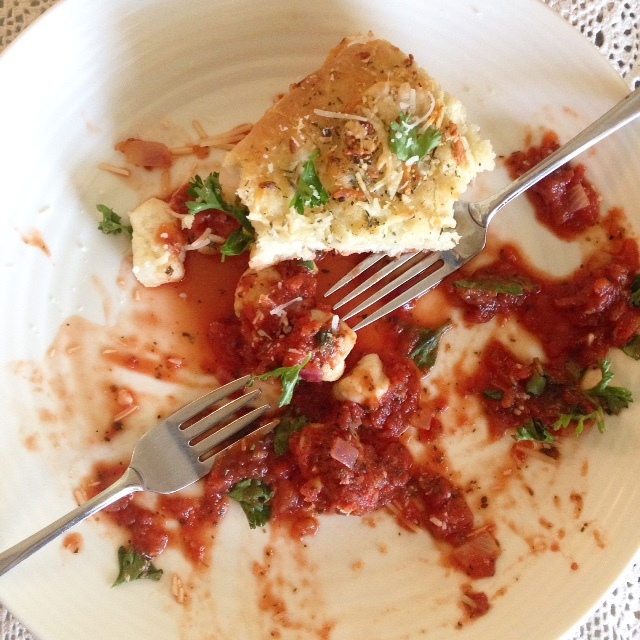 Here is the recipe we used for the gnocchi and was wonderful. We created our own red sauce. But, again, here’s a sneak peek! If you’ve had a bad day and like to eat your feelings, your feelings will be screaming for this. It’s okay. We can relate. This gnocchi is there for you. And so are we, one delicious cheese ball at a time. That’s right. Cheese. Ball. 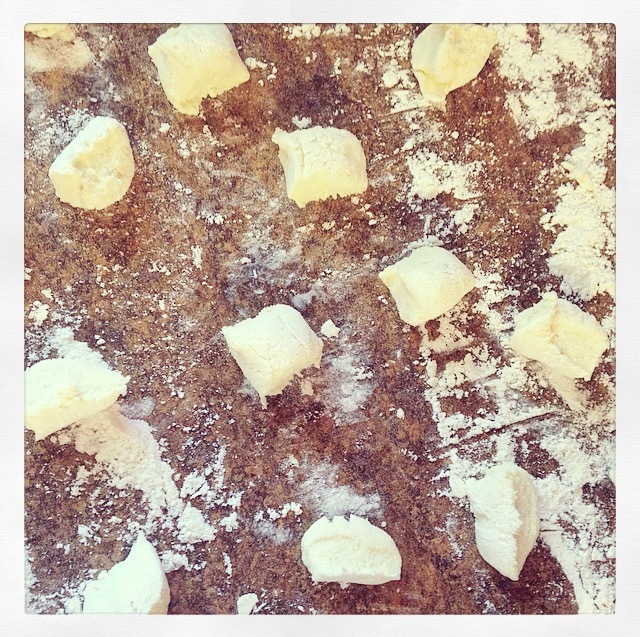 Traditionally, gnocchi are made with potatoes and can be very labor intensive. Full of love, but labor intensive. These little gems are all the love, but half the labor, but tastes like you worked your tail feathers off. What more can you ask of a recipe? 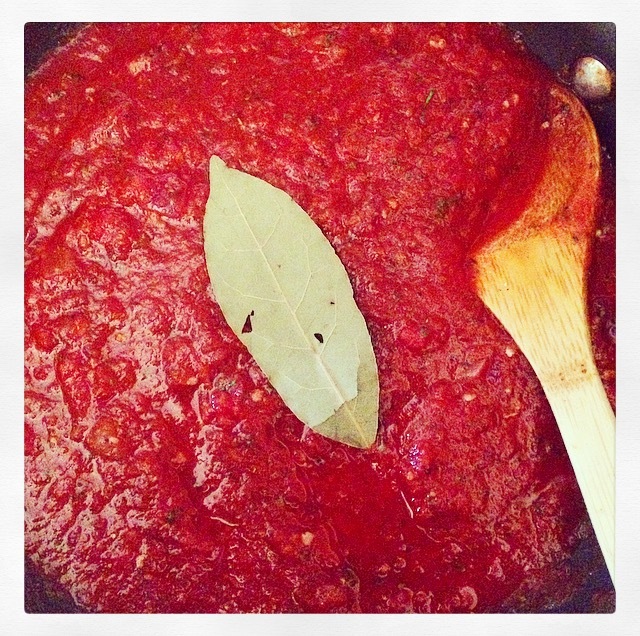 This red sauce would be wonderful on any sort of pasta! So fresh, so light, so scrumptious — the perfect springtime pasta sauce — and the perfect compliment to these rich gnocchis! Gnocchies? Is there a plural form for gnocchi? Dice onions and sauté them in a skillet with salt, pepper, and butter. Sauté for about 5 minutes and add garlic. Mix everything together and simmer for 20 minutes. The longer it cooks the flavor gets better! Before serving chiffonade the basil leaves and stir in sauce. Leave some aside to garnish. Garnish with fresh parsley, fresh basil, & 4 cheese Italian blend. Scrumptious! And now for some pints! To commence the afternoon of cooking with an energetic toddler, we needed some mommy juice. We split a Sheer Madness from Kalona Brewing Company, which described the kitchen scene to a tee and possibly our attitude by the end of the day. And do note these are probably not the correct glasses for the beer, but we like these vintage beer glasses. What do we know? We are rookies. Kalona Brewing Company, Kalona Iowa Sheer Madness (American Dark Wheat Ale)- Deep dark brown color. Smooth. Sweet malt, Caramel, roasty and chocolate flavors. 5.6 ABV, and take our word for it, visit this brewery the first chance you get. The beer, the small plates, the atmosphere is all spot-on. Perfect for a casual afternoon date or a family affair! The kid’s menu is so fresh, healthy, and creative that we wanted to order from it! And finally, to wrap up the cooking festivities, we sat and we ate and we drank and it was delicious. My tiny kitchen smelled like an Italian bistro. I wanted to bottle it up for an air freshener. We could feel all the stress in life begin to melt away. The gnocchi was doing its job. With our lupper, you know lunch and supper, we split a Two Hearted Ale from Bell’s Brewery. Bell’s Brewery, Kalamazoo, Michigan Two Hearted Ale (American IPA)- Crisp, hoppy, floral but light. 7.00 ABV. An awesome IPA. Rated at a world class level of 95 on Beer Advocate. The Bros rate it outstanding. Check out Beer Advocate before you purchase your next beer. If the beer received good ratings by other beer lovers, it is usually always pretty tasty! 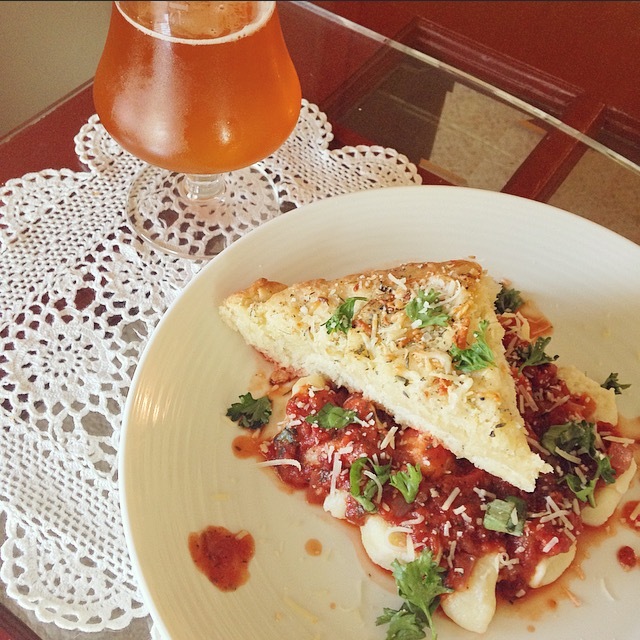 Share some gnocchi and a beer with someone you love today! And remember, kids, don’t judge a food by its photographer..
Good morning Arielle! Thank you! We will definitely check out your blog!